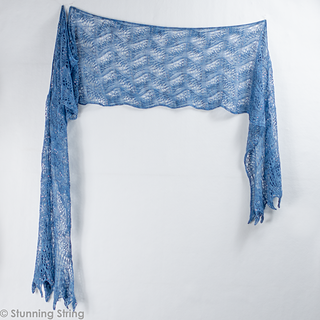 Swirling and swaying lines gradually spread into lovely beaded lace ends in this light and gorgeous scarf. Knit in a floaty lace weight yarn, with small pops of sparkling beads. 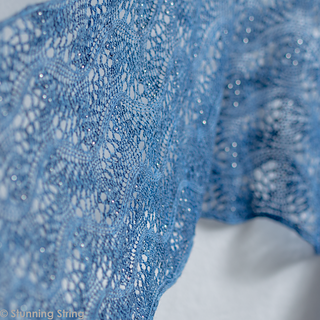 Simple stitches create this gorgeous scarf you’ll love wearing as much as making. Skills The pattern is fully written out and charted. The stitches used are all pretty basic, so it is a relaxing knit, but with lots of detail to keep you interested. Beading is optional, easy (short) provisional cast on and lace stitches. Yarn Stunning String Lavish Lace (100% Superwash Merino, 925 yds (846 m), 100 grams, 1 skein in Blue Diamond; or any lace weight yarn, 925 yds (846 m), 100 grams, 1 skein. Other 6 Stitch Markers, optional 1300 Seed Beads 8/0 and tool to apply bead: crochet hook, Super Floss or a beading tool.